How about improving maritime training using a range of innovative and effective products? Dolphin Platforms are the path to a win-win solution! Join us at Crew Connect Europe, 10-11 April 2019 at Empire Riverside Hotel, Hamburg. CrewConnect Europe is the most established and comprehensive solutions-based event, dedicated to crewing, marine education and training in Europe. The highlights for 2019 include all the latest news regarding the maritime industry’s forecast, as well as providing useful information on research, solutions from inside and outside the industry and a platform for knowledge sharing and networking. SQLearn, the first company to use e-learning for the advancement of maritime training, created Dolphin Platforms, a complete suite of specialized services for the shipping industry. Dolphin Platforms include a range of innovative and effective products, using flexible, interactive and reflective learning techniques. SQLearn’s e-learning facilities and e-learning courses are certified according to relevant ABS standards. Furthermore, SQLearn’s e-learning services are certified according to ISO 9001:2015. 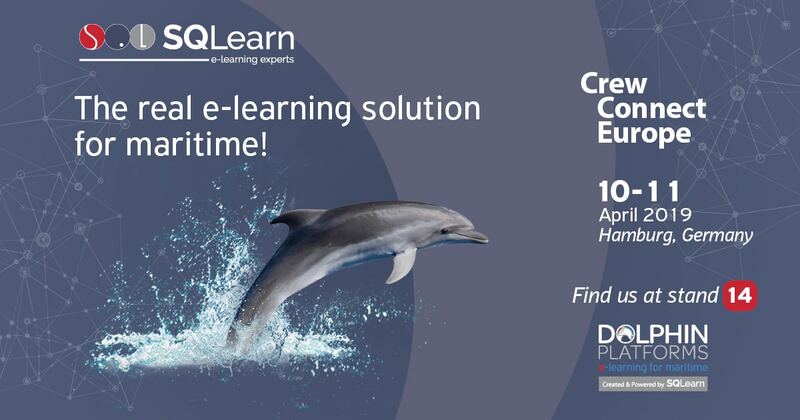 Visit SQLearn at Crew Connect Europe 2019! Our Dolphins will wait for you at stand 14!